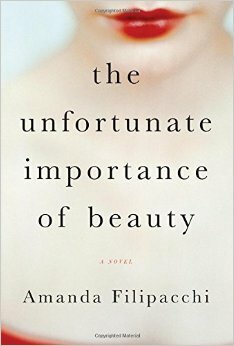 Just finished Amanda Filipacchi’s The Unfortunate Importance of Beauty. It was an extremely good book. Very surreal. Very absurd. It’s about a beautiful woman who dresses up in a fat suit in order to find a man who’ll love her for herself, and about a very ugly woman who keeps trying to convince one particular man to love her. And there’s also a murderer in there for some reason. I always do whatever I can to help Penelope. She’s a dear friend who’s had a tough life. Or rather, she had a tough three days, six years ago. She was kidnapped and kept in a coffin for sixty-nine hours. And that’s played neither seriously nor for laughs. It’s just a bit of background! At that point, I accepted that bizarre things were going to happen for bizarre reasons, and they did. Still, the novel remained very thematically cohesive, very focused on the body, and everything paid off in a satisfactory way. “Typical that a man should think of this,” Penelope mutters, looking at her shoes. It took a little while to get used to the writing style. It reminds me of nothing so much as the style in Kafka or Calvino or Houellebecq or other European surrealists who’ve been translated into English. I always assumed that the particular stiltedness of these books was an artifact of translation. I thought that maybe the dialogue in Kafka sounded more natural in German. And perhaps that’s true. But reading this book has made me realize that overly-mannered writing can create effects that naturalistic dialogue can’t. It allows characters to say more. And it allows more things to happen. And, at least in this book, it didn’t prevent me from seeing the human side to these characters. They weren’t real people, but they were emblematic of certain real things that exist in people. And that was enough to allow them to touch me. For years I wondered why people still read Thucydides, but I have to say, there is something here. This work is still relevant. If you’re trying to lie about how much you like something, here are two things you should NEVER say.